Continuing with my latest project, the smaller of the two units on the wine country property is a cozy, charming space, perfect for a couple or a small family. 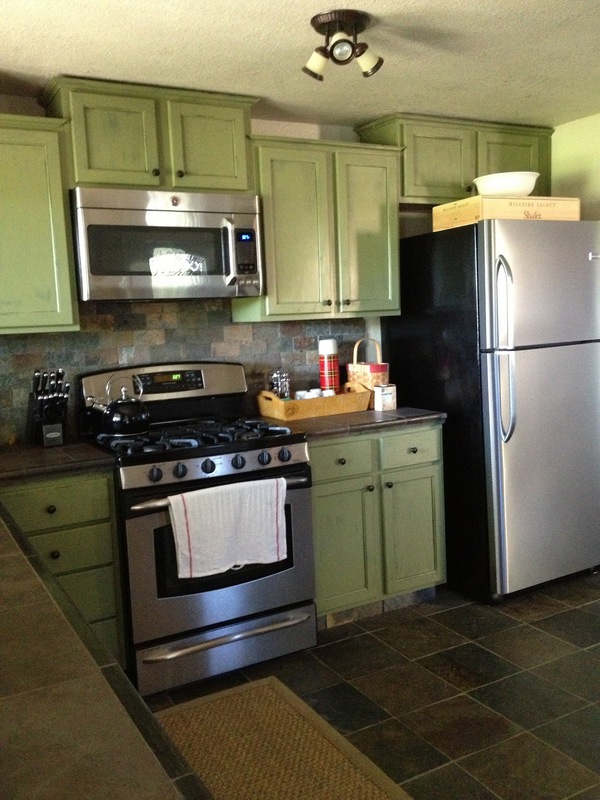 The kitchen is packed with charm with green cabinets, stone floors and countertops. 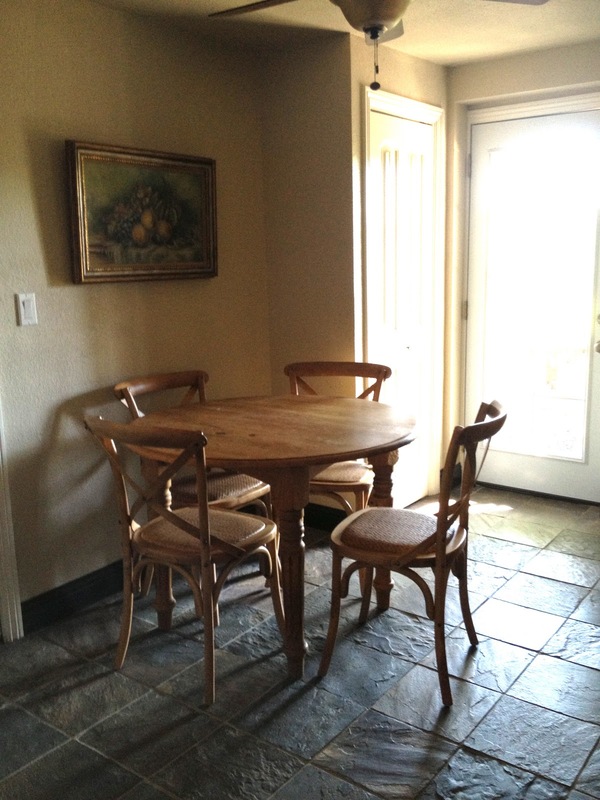 The antique pine farm table, found at a consignment store in San Francisco fits perfectly in the eat-in kitchen. 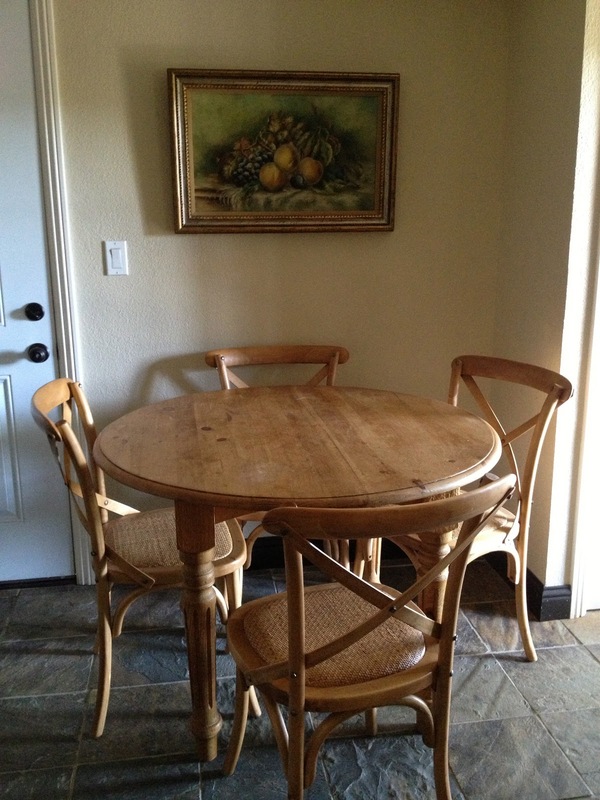 The chairs are sourced from Joss & Main, and TJ Maxx--all matching perfectly! A peak through the half wall from the kitchen, reveals a rather large living room. I love the brown wool menswear Williams-Sonoma sofa, a fabulous consignment store find! 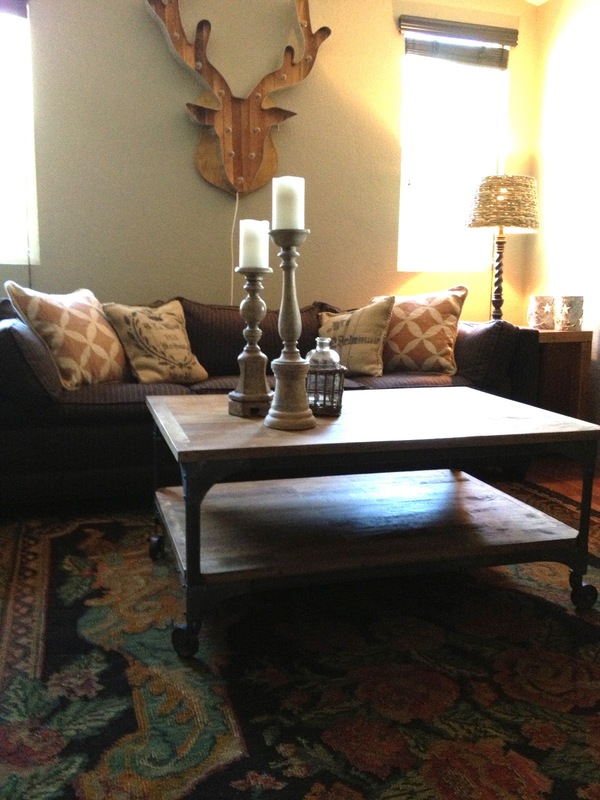 The coffee table is from World Market, the end tables are from Joss & Main. But the marquis light above the sofa is the focal point in the room, found at the Alameda Antiques Faire and handmade by Scott Coppersmith Designs. It was a splurge and worth every penny! 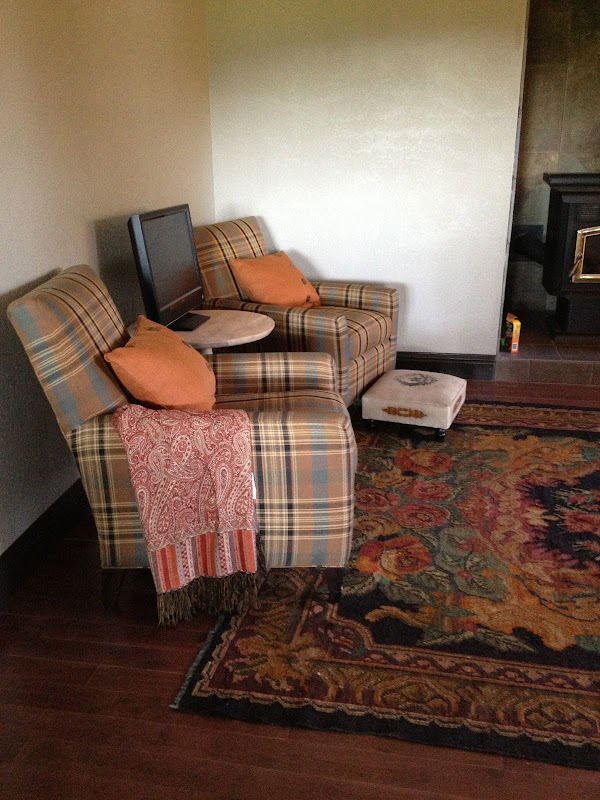 I was so lucky to find these two brown plaid Crate and Barrel chairs from yet another consignment store! The antique kilim rug is on loan from yours truly! I found the rust iron queen bed at a local mattress store. All the beds and mattresses in the house are new. The rug is a remnant I had surged, and the bedding is a combination of Ralph Lauren and Target--all "red tagged" for deep discount. 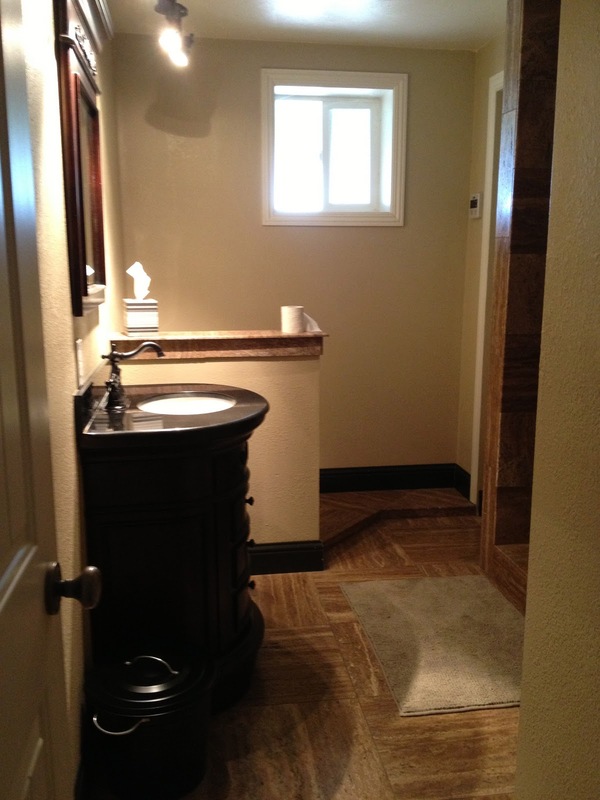 The bathroom across the hall is quite handsome. I have to say, the previous owners did a nice job remodeling the homes. I think they were DIYers, so luckily there isn't a lot to do. The second bedroom has a weird layout, making it impossible for another queen bed, so I furnished it with two twins. I envisioned this room for children, but adults would also be quite comfortable. Linen "Cute As A Button" beds are from World Market, bedding is from Ikea. 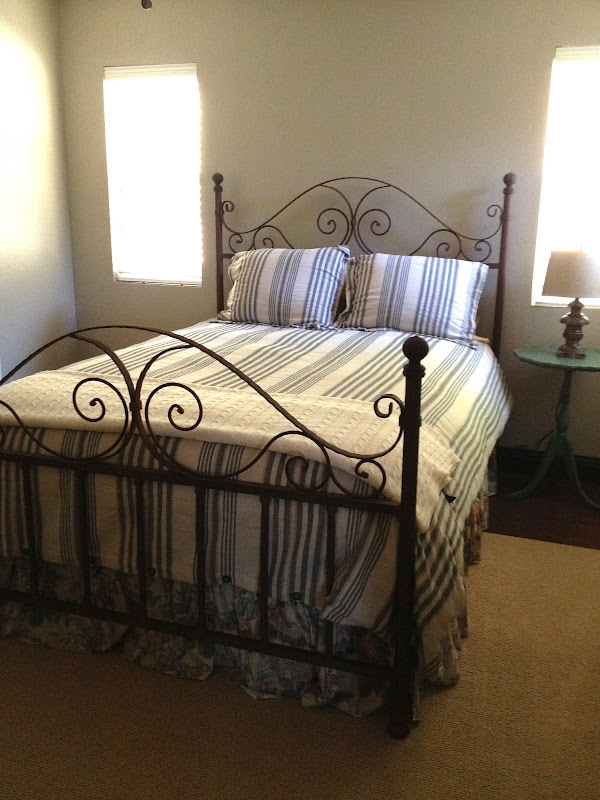 I hope to find a dresser for the master bedroom, another nightstand, lamps, more artwork and accessories still. 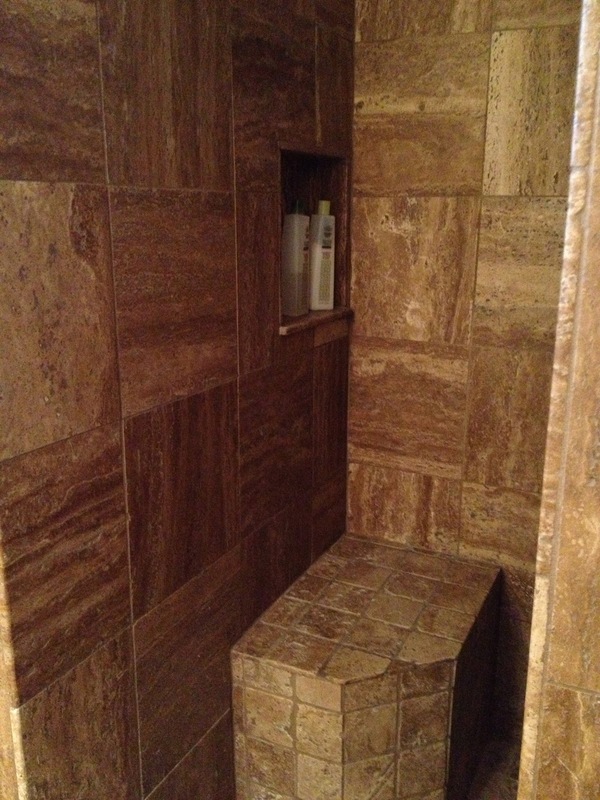 Once both units are completely furnished and outfitted for guests, there will be an official photoshoot. Plans are in place for a website and brochure to be distributed to local wineries. Honestly, starting to plan a trip. I had not heard of Airbnb so that was interesting getting onto that site for rentals but these homes you are redoing look comfy and perfect for a getaway. Love the getaway. Isn't it gun to search for things for another home . When we had our cottage I had so much fun decorating it with flea market kind of things. 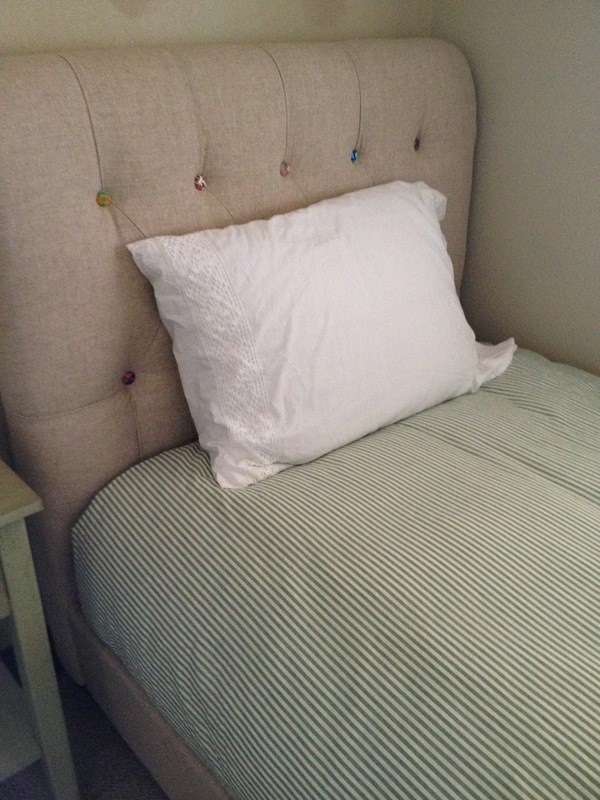 I love those Cute as a Button beds. Gorgeous getaway! Love this natural style! Great! Love those cute as a button beds from Cost Plus! I have seen the sofa but not the beds! Wonderful consignment store score on the WSH Sofa! Everything looks wonderful! I'd love to stay here. we are only 45 minutes form the wine country, but it's nice to have a whole weekend. I'd love to stay here! It is looking fabulous! I love the plaids and stone. I had never heard of airbnb either, and we are planning a trip for Sept 14 to Italy. We hope to stay at least a month. I have been looking at airbnb since you mentioned it in your last post...thanks! And thanks for stopping by my blog and saying such nice things about my outside paint and porch! I think you have a real winner here Delores! Love all of your warm and cozy bargains!So YOU!! I can't wait to stay there!!! Just wonderful, I love, love the black iron bed and bedding! Also all the bargains you made for this neat getaway! Thanks so much for following, I just followed you back! I dont think Ive scan anything like this before. So good to find somebody with some original thoughts on this subject. nice one for starting this up. This website is something that is needed on the web, someone with a little originality. Good job for bringing something new to the internet! The inside is perfect for a rental...cozy but not fussy. I'd be spending all my time out on the porch or the fire pit. Great finds Delores! Simply adorable and comfortable. Look forward to the finished project. Looks like a fun place to get away to in the wine country. You did a great job! What a nice place. A place to forget about all that is troubling. Natural feeling. I like the painting of fruit over your kitchen table, very nice. Thank you for visiting my blog and becoming a follower. I now will read earlier posts you have, especially part one of the latest. So wonderful! 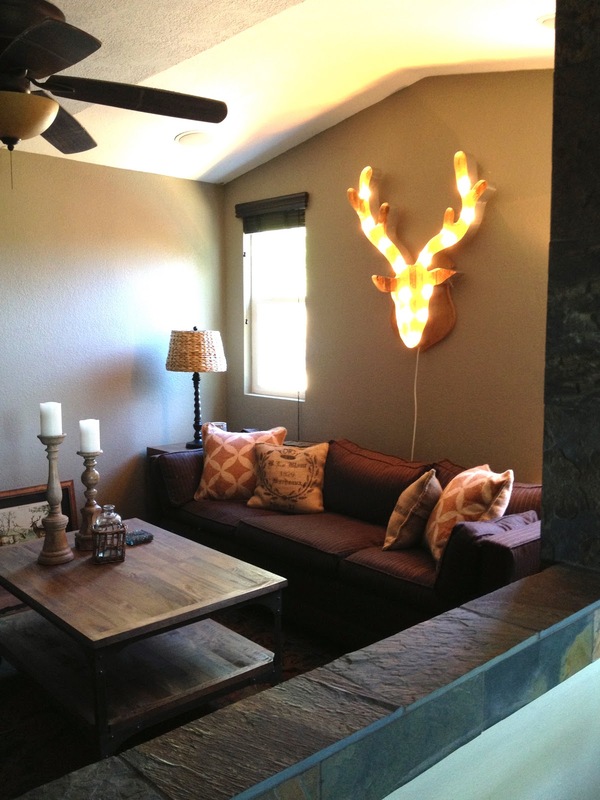 I was wondering where you were putting that lighted deer head lol It looks so cozy!